In this article I explain the fundamental concept of digital logic in simple and clear language so that anyone can understand it Lets look at a simple electric circuit with a battery, a light bulb, and a switch. This circuit is shown below. With the switch open, the light bulb does not illuminate. With the switch closed, the light bulb illuminates. Lets designate the situation where the light is off as "0". Lets designate the situation were the light is illuminated as "1". What we have is a system with two possible situations, referred to as a "binary" system. It doesn't matter what voltage the battery is, as long as its high enough to illuminate the light. Light off is binary 0. Light on is binary 1. Lets make a slightly more complex circuit. 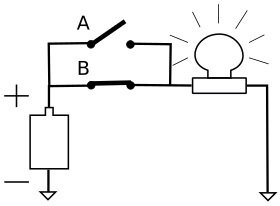 In the circuit shown above, switch A is open, but the light is still illuminated. That's because switch B is closed, providing a path from the battery to the light. 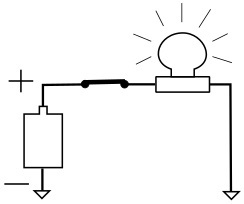 The idea behind this circuit is - if switch A OR switch B is closed, the light is illuminated. If both switched are open, the light will not be illuminated. Of course if both switched are closed the light will be illuminated. This circuit functions as what we call a logical OR gate. 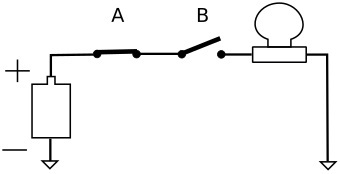 In the circuit shown above, switch A is closed, but the light is not illuminated. This is because switch B is open, breaking the path to the battery. If switch B were to be closed, the light would be illuminated because then there would be a closed path from the battery to the light. If either switch is open, the light will not be illuminated. Both switch A AND switch B must be closed for the light to be illuminated. 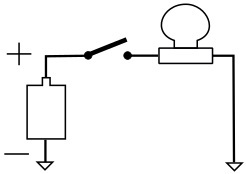 This circuit functions as a logical AND gate. These circuits demonstrate the fundamental concept of logic circuits.